We jumped out of our taxi between two rumbling buses so I knew we would be dodging a lot of visitors at Church of Shepherds’ Fields. 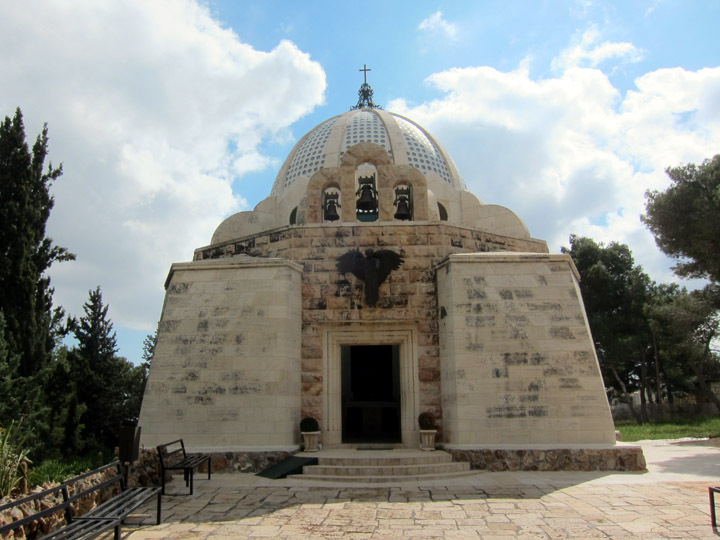 Because of its large gardens and the ability for people to spread out, this church is popular with Christian big bus tour groups which give their lecture on history or religion here before heading on to the more cramped Church of the Nativity. It was no surprise then that there was a group of French tourists sitting in the church listening to a priest as we slipped in to have a look. 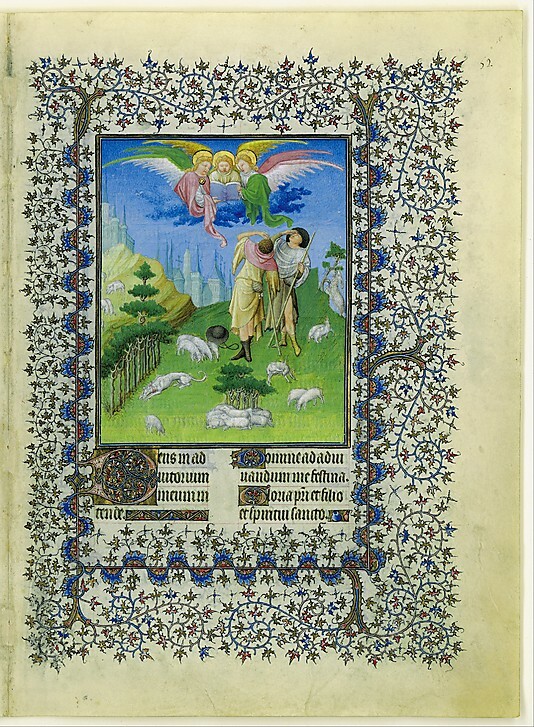 In the Church of the Shepherd Fields, traditional church design has been bent into a circle. The small inner circle comprises the central worship area with the altar and supports an airy dome. Around this area is a concentric aisle with shallow chapels depicting scenes from the Nativity. The art is very contemporary while not being stylized in any way. Benches for worshipers are placed within the arches that support the dome and against the back wall. As I crept around through the side-chapels, the French group sitting in the inner circle of benches began singing Christmas carols. The first tune was Silent Night but I didn’t recognize the second. It was pleasant enough singing with all the voices averaging out like a congregation on Sunday. As the French folks continued, a group of Nigerians arrived and respectfully encircled the seated group. Some of the Nigerians were in colorful traditional clothing while others were in tee-shirts emblazoned with the tour company’s logo. When the French had finished, we all clapped; the leader of the Nigerians complimented them and respectfully asked if they could sing too. There was no objection from the French priest and so the Nigeria minister raised his hand to start the group in song. It started like a tide wave of sound. The leader had called out a phrase and the group sang it back to him in a booming four part harmony. 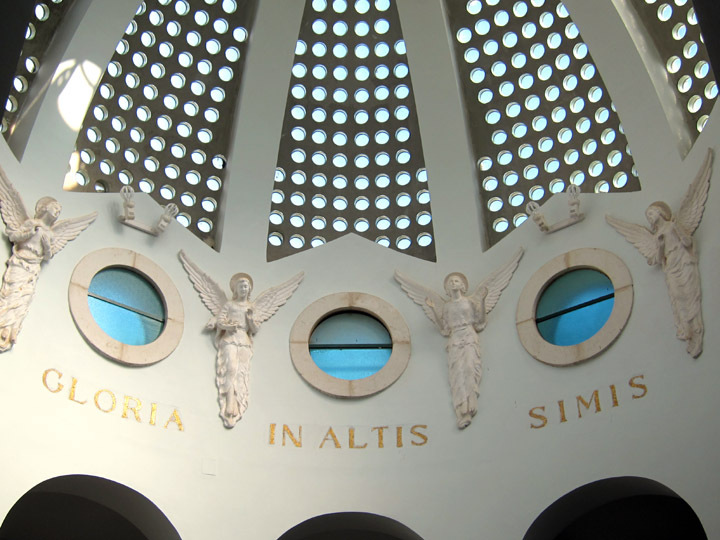 Their voices reverberated through the dome above us. They continued singing back as their leader struggled to get out the next line over their ringing voices. The power and devotion in their song was amazing. Much like the French group, I just stood there, listened, and got chills from the intensity of the moment. 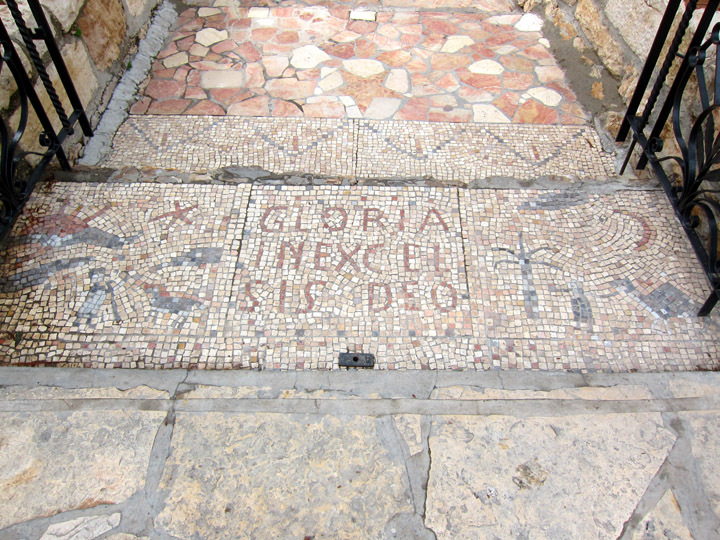 “Gloria in excelsis Deo (Glory to God in the highest)” mosaic floor from the grounds of the Church of the Shepherd’s Fields, Bethlehem. When the Nigerians had finished, there was a rousing round of applause. Everyone was giddy and shaking hands. People were posing for photos together; somehow I got pulled into a couple pictures even though I was just soaking in the moment and not part of either group. Then as quickly as these heavenly clouds had gathered, they cleared and Mr. Daydream Tourist and I were left alone in the church. From an artistic stand-point, the Church of the Shepherd Fields was one of the least impressive churches I’ve visited. The architecture is simple and the decoration is fairly uninteresting. 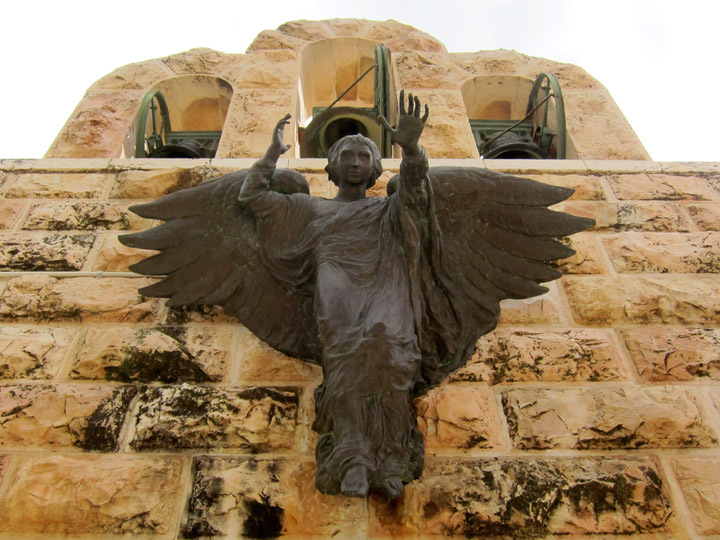 But for completely unexpected reasons, it turned out to be one of the most remarkable churches I visited in Israel. This once again shows that travel is not just the places you visit but also the people you meet. It looks so interesting – great pictures and post! This may be the most evocative post I’ve read this year, Christina. 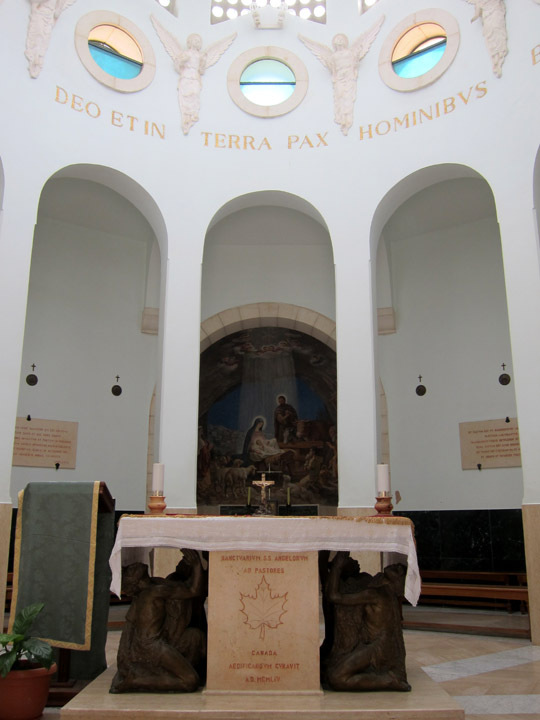 It would be a dream come true to visit the Holy Land and wander upon choirs of the faithful singing impromptu, unaccompanied, in a simple church dedicated to the shepherds. Beautiful post.